Welcome to another Polyvore session! I got really inspired looking through all the wonderful fashion blogs I'm currently following and found that the Little White Dress is having a major hit during this season. So I decided to create, using Polyvore of course, two different outfits (one for day and one for night) using the same Farndon Dress from Aubin & Wills. I used this dress because I find it so simple yet so versatile. It can be worn with almost anything and still be the shining piece of the overall look. The first look is perfect for a lunch date, shopping with friends or a casual afternoon. The denim jacket gives the look that 'laidback' feeling, while making a pretty contrast between the colors. 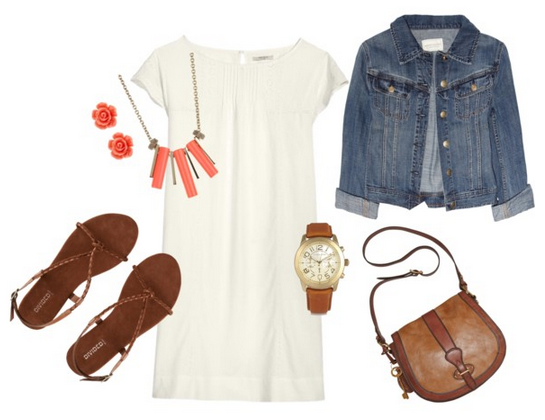 The sandals and bag compliment the outfit with a bohemian, relaxed vibe, which comes perfect for the casual event. Accessorizing for a casual look is a lot more fun, especially when wearing a white dress, because you can add so many different colors, textures and sizes of jewelry, and depending on every style, the look will always improve. The second look would suit perfectly for a dinner date, a party or any night out event. The same dress can work beautifully for a formal evening, plus pairing it with some elegant, bright heels makes a real fashion statement that simplicity can sometimes shine the most. The clutch and the accessories chosen give the ensemble the color that it may somehow be lacking since the dress is just white, which is an advantage since any color you choose to accessorize with will probably work perfect! For the list of all the items used for LWD Day Look click here & for the list of items used for LWD Night Look click here. To see some of my other Polyvore creations click here. Would you wear one of these looks? How would you wear a LWD?